Hello! I'm a 25-year-old programmer who discovered the Elder Scrolls series in June 2012. It was completely on a whim, really; it was 50% off at the store on the day I bought my college laptop, and all I knew was that Skyrim was some sort of fantasy RPG and that it was "really good". I never would have guessed what I was getting into. So, as far as my journey to UESP, after Googling for help on quests, I found UESP in many of my searches, and eventually determined that it was the best wiki. 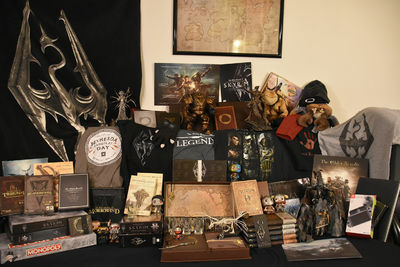 I discovered the UESP forum in October 2012, started really contributing to the wiki more once Dragonborn came out, joined the forum moderating team in May 2013, and became an autopatrolled user in anticipation of ESO's release in 2014. I also gained access to the UESP Facebook page in August 2014 and currently co-run it, have access to the Twitter and Youtube and post occasionally, and am also an admin on the UESP blog and write for it from time to time. I'm still working my way through the ES series. I also am a collector of ES merch, as you can see by the picture on this page. This user is an advisor of the UESP ESO guild on the North American PC server. The Hero's Guides to the Elder Scrolls Online - Page and subpages basically entirely by me. The Improved Emperor's Guide to Tamriel - Proofread the transcription to fix typos, add released concept art, and missing text, and made the character and plot summary pages. The Elder Scrolls Legends - Started many of the namespace's pages (including its main one) and created or updated most card pages/images. Names - Added all the playable race names from ESO and regularly update them. Constant project: Elder Scrolls Online - adding info and images. I do a lot on the pets, mounts, and other Collectibles pages, as well as creatures and NPCs. Constant project: Legends - Need to play through Clockwork City. 26 This UESPWikian is 26 years, 9 months, and 20 days old. This user has been on UESPWiki for 6 years, 8 months, and 4 days. This user has made a grand total of 13,483 edits in 2438 days. Elanwe - My main character, an Altmer DPS stamplar in the Aldmeri Dominion who uses a bow and dual-wields daggers. Amusingly, there happens to be two quest NPCs that share the name, which I didn't know about at the time. Kirweneth - Bosmer DPS magicka warden in the Aldmeri dominion. Tajeetha - An Argonian dragonknight magicka(?) tank in the Ebonheart Pact. Based on a similar character I used in the beta. Aijhirri - A Khajiit DPS stamina nightblade in the Aldmeri Dominion. Loosely based on a similar character I used in the beta. Niralie - Altmer magplar healer in the Aldmeri Dominion. Based on my charcacter in the RP "Tamrielic Adventures 2" on the UESP forum. Alarra - an Altmer. Mostly uses a one-handed sword, bow, and magic. She joined the Imperials and the Dawnguard. Completed basically everything with her. I chose my username based on her: when creating her I wasn't aware of Altmer naming conventions but thought it sounded like a good elven name (and it pretty much fits as an Altmer name). Varilanya - Altmer mage who tries to rely on magic, only using sword and sometimes shield when absolutely needed. She's on my Nintendo Switch copy of the game. Brielle - a Breton spellsword. Completed most faction questlines, still have some Daedric quests, the main questline, Knights of the Nine, and Shivering Isles to go. Feryn Sarethi - a Dunmer. I've only played around 8 hours with her so far and can't remember her skills right now. Daeranel - a Bosmer. She uses a bow and either a shortsword or a dagger, I can't remember. This page was last modified on 1 September 2018, at 20:24.